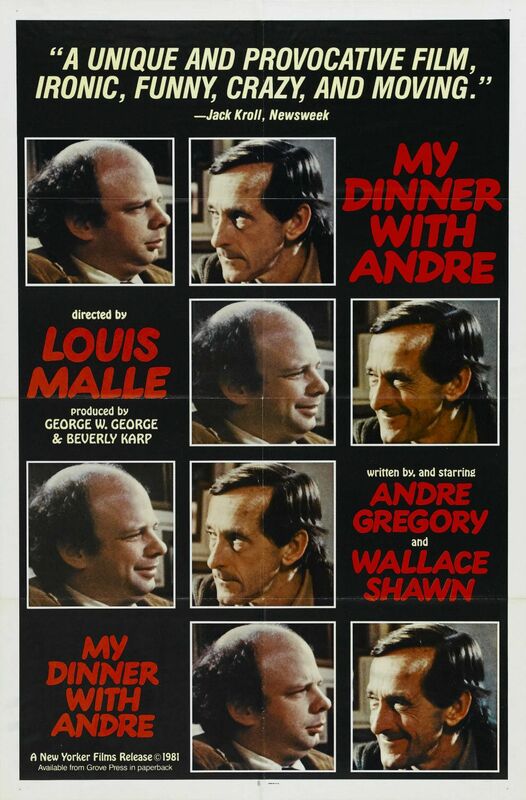 ‘My Dinner with Andre’ contains the perfect one hundred and ten minute conversation. Well, it’s probably closer to one hundred minutes but let’s not nit-pick; it is the kind of conversation we all one day dream of having, a perfect connection between two individuals, free of distraction and dead air. Wallace (Wally) Shawn and Andre Gregory sit down over dinner and indulge in this fascinating talk that touches upon all manner of deep intellectual topics. In truth it is a conversation that we’re never likely to have. There will never be such congruence and that perhaps is saddening. What’s amazing is that this was captured on film in the first place. It’s bold, something that would’ve ordinarily existed as an imitation Beckett play on some small theatre run. What’s amazing is that the film, despite its intimacy, is so thoroughly engaging. My only exposure to the work of Wallace Shawn was his acting on the 90’s high school ditzy comedy ‘Clueless’ and its subsequent TV spin off. I perceived him to be one of those character actors who appear in a ton of films, does a solid enough job but never shines. Shawn is fantastic here, playing himself. Does he deserve credit for doing this? I’m not sure. Actually, I’m going to correct myself here because I don’t know if he was playing himself – because a screenplay was written, scenes were cut. This isn’t a warts and all shoot where the camera kept rolling. Shawn and Gregory were simply playing roles, and not themselves. It is our performing of certain roles in our lives that forms an important part of their conversation. During Shawn’s journey to a restaurant across NYC he is self-deprecating and conscious of his struggles as a playwright. He bemoans the fact that he is not earning enough, that his partner Debbie has had to take a job as a waitress to pay the bills. He fell in love with the arts as a kid and wanted to devote his life to the arts but instead he is stuck in the capitalist wheel, feeling the pinch. “Now I’m 36, and all I think about is money”. He’s a little anxious about meeting Andre Gregory. After a period of success in the world of theatre Gregory disappeared off the map, he stopped working on plays and went travelling. This appeared to be a spiritual journey for Gregory, where he attempted to seek meaning and find out who he was. He wanted to get in touch with his true self. The pair meet up in a swanky restaurant. The camera shoots from the next table, gazing across at Shawn and Gregory as they talk through a three course meal. Waiters come and go, serving the pair, occasionally checking in that everything is ok. By the end of the meal Shawn and Gregory are the only people left in the restaurant. Shawn doesn’t impose himself in the conversation, to an extent he is in awe of Gregory, and because of this they don’t talk as equals. Perhaps this is because Shawn is a tad neurotic, and hasn’t had as much success; he’s not quite sure where he stands, whereas Gregory is worldly, confident and decidedly sure of himself. Shawn therefore asks a lot of questions because questions relax him and he enjoys finding out about people. His line of questioning is unobtrusive, and he is completely engaged in what Gregory has to say. Though Gregory travelled to far-flung places like Tibet and India, he didn’t always make have life affirming experiences. “I’ve been to India and I just felt like a tourist. I found nothing”. It was an experience of being buried alive on Long Island that was most profound for him. As the camera focusses on Gregory’s face you can see the fear in his eyes as he talks about the soil falling over his casket. There are some humorous moments. When their quail dish is served Shawn exclaims “I didn’t know they were so small”. Shawn’s endearing ignorance about posh restaurant etiquette immediately puts us on his side. He is our doubting voice, the voice that feels at times like telling Gregory to stop being so damned pretentious. The trouble is Gregory’s storytelling is spellbinding, he hooks you by the top lip, and you want to listen to his spiel. You can’t get mad at him. The film, intentionally or otherwise encourages the viewer to question themselves. There is a significant part of the conversation, which I shall attempt to paraphrase, it explains that when you think about it we are habitual, “going around like unconscious machines” and the anxiety builds within us because we perform our roles, like actors. We don’t act naturally, we don’t feel. That is why we see therapists or counsellors, we read self-help books. We look at others and we think they are getting on, content in their lives, but we can’t understand or relate because we live in ignorance of each other. Wally: Suppose you’re going through some kind of hell in your own life, well you would love to know if friends have experience similar things. But we just don’t dare to ask each other. Andre: No, It would be like asking your friend to drop his role. Towards the end of the film Shawn talks about the simple things in life, such as drinking coffee and reading the paper, he asks Gregory why is it necessary to have more? Or even want more? Shawn is actually happy with his lot and I think by the end of the film, after the conversation, he realizes this. He gets a taxi home and says he’ll tell his partner Debbie everything about his dinner with Andre.